Every Sunday is considered a day of obligation in the Catholic faith; and the faithful are called to worship at Mass every Sunday. Other particular days celebrating feasts of the Lord or the Blessed Mother are considered days of obligation. On these days, the faithful are called to worship at Mass, even if the feast does not fall on a Sunday. Easter is considered a particular day of obligation for all Catholics. But why are they obligations? Holy Days of Obligation? Or Holy Days of Opportunity? This feast, closely connected to the feast of Christmas, is the most important and oldest of the major feasts of Mary. Mary’s Divine Maternity became a universal feast in 1931. Liturgical reform initiated by Vatican II placed it on January 1 in 1969. Prior to this, this feast celebrated on January 1 was the circumcision of Jesus. As a conference, the U.S. bishops decided, with Vatican approval given July 4, 1992, that when the solemnities of Mary, the Mother of God (January 1), the Assumption (August 15) or All Saints (November 1) fall on a Saturday or Monday, it is not an obligation to attend Mass for these feasts. Although the obligation to attend when these three holy days fall on a Saturday or Monday is abolished, parishes are to continue to observe these Holy Days by scheduling one or more Masses at a convenient time so that people who wish to participate are able to do so. This Solemnity, celebrated each year, is a commemoration of the Resurrection of Jesus Christ form the dead (see Mark 16:1-7). It is considered the greatest of all Christian feasts and holds a central place in the liturgical year. The celebration of Christ’s Resurrection continues for a period of 50 days, that is, from Easter Sunday to the Solemnity of Pentecost. This feast is celebrated the fortieth day after Easter Sunday and commemorates the elevation of Jesus into heaven by his own power in the presence of his disciples. It is narrated in Mark 16:19, Luke 24:51, and in the first chapter of the Acts of the Apostles. This is the principal feast of Mary. It has a double purpose: first, the happy departure of Mary from this life and second, the assumption of her body into heaven. A truth of faith, proclaimed as a dogma by Pope Pius XII on November 1, 1950, which holds that “the Immaculate Mother of God, Mary ever Virgin Mary, when the course of her earthly life was finished, was taken up body and soul into the glory of heaven.” This belief was evident from the very early days of the Church. This day we honor all the saints: not only those recognized as saints, but all those who have achieved the eternal reward in the presence of our Lord. In remembering the saints, we also recall our own baptismal call and invitation to the same eternal reward. This feast was first celebrated on May 13, 610, when Pope Boniface IV proclaimed the day Feast of All Holy Martyrs in Rome. The intent was to honor all martyrs who were not included in local records. 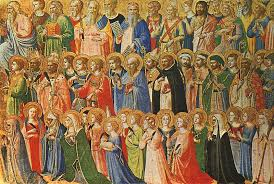 In 835, Pope Gregory IV changed the date and name to November 1 and Feast of All Saints. A fall date allowed people to celebrate with food from the fall harvest. The Immaculate Conception of Mary, the Mother of Jesus, is the belief that God preserved Mary from any inclination to sin, the inheritance of original sin passed on to all mankind from Adam and Eve. Since Mary as the Immaculate Conception is the Patroness of the United States, this feast is always a Holy Day of Obligation, except when it falls on a Sunday, when the liturgies of the Sunday prevail. This feast, one of the two major feasts of the liturgical year, celebrates the birth of Jesus. The other major feast of the liturgical year is The Resurrection of the Lord.